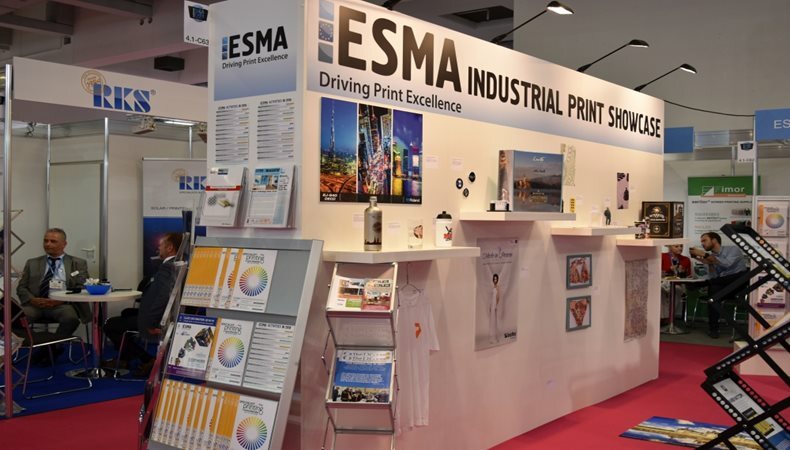 ESMA will return to the Global Print Expo 2019 showcasing various printing applications with their ESMA Pavilion, Industrial Print Showcase and members of ESMA’s Expert Team will be hosting “Ask The Industrial Print Expert” sessions. ESMA, the European Specialist Printing Manufacturers Association focuses on all industrial, functional and specialised printing applications as well as graphics applications that lead to disruptive developments in printed interior decorations, printed electronics plastics, textiles and glass. The ESMA Pavillion will be located at the Global Print Expo 2019 in hall A6 stand A73 where examples of industrial print applications will be showcased. To obtain a complete understanding of services that ESMA provides and to demonstrate what screen and digital printing are capable of, all visitors are invited to the ESMA’s Industrial Print Showcase which is incorporated in the ESMA pavilion. 5-member companies will be present at the ESMA pavilion that includes Fimor, Global Inkjet Systems, PVF, RK Siebdrucktechnik and UMS. Fimor will showcase their Serilor line of polyurethane squeegees and related accessories. Global Inkjet Systems are a developer and supplier of application software, drive electronics and ink system components who support a wide range of industrial inkjet printheads. PVF are a partner of NBC Japan specialize in high precision meshes derived of materials like nylon, polyester, bi-polyester, polyarylate, stainless steel and tungsten. RK Siebdrucktechnik will exhibit their range of stabilised squeegee blades, grinders, peripherals and special application solutions. UMS offer dissolved oxygen (DO) sensors, meters, transmitters for inkjet ink. The industrial print showcase will feature various samples provided by members and their customers. Application examples include printed and flocked glass, flocked wallpaper, printed electronics in membrane keyboards, membrane switches, direct-to-shape printed PET bottles and tubes, corrugated boxes, digitally printed interior decoration items (wallpapers, ceramic tiles, aluminum elements, with haptic effects), high resolution 3D inkjet printed objects and examples of hybrid technology to demonstrate the combined use of digital and screen for special effects. Various ESMA technology partners will attend the exhibition alongside members of the ESMA Expert Team. These partners will host the “Ask The Industrial Expert” sessions at ESMA ‘s stand which will be located in hall A6 stand A70C. ESMA’s expert team will also be available to provide technical advice on digital printing technology, industrial printing applications and business innovation. Sessions can be booked exclusively through the official FESPA 2019 show app, available to download on the App Store and Google Play from April. Roland Biemans is an industry veteran, with past positions at ink manufacturer Kiian Digital, machine manufacturer Hollanders Printing Systems, software developer Aurelon, industry association ESMA and the Textile Competence Center. As founder of LMNS – an expert group focused on product and business development for the graphic arts, visual communication and printing industry – he continues to connect the dots in textile (graphics, interior, clothing), packaging (plastics, corrugated, labels), glass (flat and hollow) and specialty print (industrial, dedicated). Steve Knight has a background in electronic engineering and has been involved in the development support, sales and marketing of disruptive technology to industries using imaging technology since 1986. Steve has worked for leading companies in a variety of roles in global positions as well as consulting for numerous companies on the development and launch of digital print equipment. He is the co-founder of TheIJC (The Inkjet Conference) and TheIJT (The Inkjet Training). With a 15-year family-company background in manufacturing of printing machines and pre-press solutions for packaging, containers and optical media, including the development of the first industrial digital printing machine for DVD media in cooperation with Indigo in 1999, Oliver founded K-Flow GmbH in 2005 after the sale of his family company and has been an ESMA board member since 2007. K-Flow was rebranded as K-Flow Consulting in 2016 to reflect the increasing need of customers for unbiased and comprehensive technological and strategic consulting services. K-Flow Consulting operates in two key business areas: development of bespoke colour communication software solutions, as well as consulting and project management services for all technical and strategic aspects of industrial screen and digital printing applications. Thomas Poetz, graduated in Business Administration, is an expert in the inkjet printing industry since about 20 years. For more than 15 years he has been working as the Executive Director of 3P InkJet Textiles AG, taking care about product and marketing development. Under his leadership the products that the company developed got a lot of international awards - one product was even used by NASA in the space shuttle. Thomas integrated 3P InkJet Textiles AG into Verseidag GmbH in 2011 and after that he started his consulting company in the inkjet printing Industry. He is a well known speaker at international conferences, talking about using the inkjet technology to create and decorate surfaces and to develop new business concepts. In the last years he has taken on a part-time lecturing job at the University of Applied Sciences Hof-Münchberg where he is educating textile design students. Jochen Christiaens has almost 20 years of experience in product and business development of inkjet printing technologies and applications. As a product and market specialist, Jochen led development projects with international OEMs in Asia, USA and Europe, for the graphical and industrial printing environment. He executed extensive market researches for the purpose of defining an entirely new inkjet inks product portfolio for large format and industrial printing applications, a next generation coding and marking late stage customisation single pass print engine for pharmaceutical, cosmetic, security print, banknote, passport and credit card industries. He supports ESMA in connecting the dots by organising academies and practical courses. Within the LMNS Group of experts, he focuses on key developments of inks (pigments, masking liquids) packaging (plastics, corrugated, labels), glass (flat and hollow) and speciality printing applications (industrial, dedicated, direct-to-wall printing). With his expertise, Jochen specialises in the development of niche applications, M&A due diligence and strategic market and product development. After holding CEO roles at Klinger GmbH, Deutsche adp and dpm Digital Printmedien, Philipp Klinger joined ColorGATE and Flexa Srl in 2011 where he acts as the European Sales & Marketing Manager. Simultaneously he offers services to the digital printing industry as the CEO of Softcon Gmbh. Stephan has practical experience as textile engineer of more than 30 years in both analogue and digital textile printing. Starting from screen printing and rapidly becoming involved with digital printing technology, he can be considered an early adaptor to textile inkjet. He has gained practical experience both as Production Manager and Managing Director of a textile printing factory where he successfully completed the changeover from analogue to digital. Additionally, this knowledge is complemented by further experience as international Sales Manager working for a reputable digital ink manufacturer. Since 2016, Stephan is offering consultancy services for companies in need for transformations from analogue to digital.